These 4 pendants are based on the gems and materials of the ring set by Clint Bellanger (http://opengameart.org/content/ring-set-precious-metals). As with the rings, they are intended to be used as item icons for RPGs and the like. Each pendant is roughly 25k triangles. Contained in the zip is a Blender file and the reflection textures. 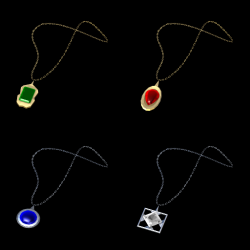 In the Blender file, each pendant is on its own layer. They are beautiful. They have an excellent finish.